This is the thirteenth of a series of posts that report on the state of the parties as measured by opinion polls.By pooling together all the available polling evidence we can reduce the impact of the random variation each individual survey inevitably produces. Most of the short term advances and setbacks in party polling fortunes are nothing more than noise; the underlying trends – in which we are interested and best assess the parties’ standings – are relatively stable and little influenced by day-to-day events. If there can ever be a definitive assessment of the parties’ standings, this is it. Further details of the method we use to build our estimates of public opinion can be found here. For much of the past year, our monthly reports have focussed on the remarkable stability of public opinion. Would the largest public sector strikes in decades hurt the coalition? We saw no evidence for it. What damage would Cameron’s links to Rupert Murdoch’s collapsing media empire do? Not much, we found. Surely the scenes of burning cars and rioting youths in the nation’s big cities would have an impact? Not that we could see. Through riots, strikes, war with Colonel Gadaffi and with his own backbenches, David Cameron has had one solace: his opinion poll ratings remained solid as a rock. This month, however, our 13th report reveals that the picture has changed dramatically. We estimate Conservative support at 33.3, their lowest level in the whole of the government’s term to date. This figure is a drop of 3.9 points from the end of February, by far the largest monthly drop in our series to date. Cameron’s coalition partners the Liberal Democrats also drop, though less drastically: we estimate their support at 7.6%, down 0.6% and equal to its lowest point in the term. Labour’s show an equally dramatic surge: their support rises to 40.6%, up 3.4% on February and close to their highest points in the parliamentary term. Nor are the shifts limited to headline polling numbers: pollsters who regularly ask leadership approval and party image questions also reported sharp negative shifts in opinion about the Conservative party and its leaders, often to record lows for the Parliamentary term. What has caused this dramatic shift? It has been an eventful month, so there is no shortage of potential candidates. Top of the list is the budget, which received criticism from across the ideological spectrum. The left wing press fulminated in particular about the cut in the top rate of income tax; the right wing press grumbled about reductions to pensioners’ tax allowances and an obscure change to the tax treatment of hot snacks – dubbed the “pasty tax” – attracted criticism from all quarters. An unpopular budget might be political misfortune enough for one month, but it was followed up by several other damaging stories. First came “Cash for Access” – the undercover footage of the Conservatives’ co-treasurer Peter Cruddas boasting of his ability to get wealthy donors a seat at the top table in exchange for fat cheques. Then came “Tell Dave Everything” – the derisory twitter handle for government proposals to expand surveillance of social media, which attracted immediate opposition from civil liberties groups and from the Conservatives’ coalition partners. Then to cap it all off, there was a fuel crisis. If the early Blair years have one lesson to teach, it is this: don’t let the petrol run out. The 2001 fuel crisis, when angry tanker drivers blockaded the fuel terminals and forecourts ran dry across the nation, was the only occasion when Blair’s Labour fell behind the Conservatives in their first four years in office. Now, once again, voters were confronted with footage of long queues for fuel and empty service stations. In the background to these serial crises, there was also the continued dreary drumbeat of bad economic news – weak economic growth; stagnant incomes; rising unemployment; further cuts to public spending. And we should not forget the carry-over from previous months’ dominant stories, which could continue to influence public opinion well after the newspaper editors move on – for example the negative reception to the government’s NHS reforms and the fading into the background of Europe as an issue, which only a few months ago had provided Cameron with a boost, particularly among right-wingers inclined towards UKIP. It is impossible to know which of these factors has driven the recent change in opinion, and in all likelihood it is a mix of several, and perhaps others besides, but we can offer a few theories about why the events of March have left their mark on a party which has brushed off so many other eventful months. In particular, there are five possibilities. A first explanation is that the events of the past months have – perhaps more than previous crises – tended to reinforce existing negative stereotypes about the Conservatives. Cuts in tax for the very rich, alongside cuts in benefits for the very poor, and followed immediately by a scandal over very wealthy people buying access to the Prime Minister, resurrected the old “nasty party” image of the Conservatives as a party for the rich and the posh, uninterested in the struggles of the average voter. A second possibility is that the past month’s events have damaged the Conservatives’ reputation for competence. In general, Cameron and his team have tended to score well with voters on this measure, but one common thread running through “pastygate”, the fuel crisis and the NHS reform battle was the incompetence with which events were handled by senior government members. The Treasury was caught off guard by the negative reaction to the “pasty tax” and compounded the problem with tone deaf populism about the Prime Minister’s love for heated snacks. The initial government response to the fuel crisis was to encourage voters to stockpile fuel in their homes, which only encouraged panic buying further and may have contributed to a tragic accident when one voter ignited petrol in their kitchen. Meanwhile, the NHS reform debate was a failure of communication from start to finish, with government ministers unable to find a clear rationale for the reforms which assuaged public concerns. Research suggests perceptions of competence are central to voters’ evaluations of government, so a series of crises which undermine such perceptions may do particular damage at the polls. A third factor was the way the past month’s events have alienated previously loyal groups. The budget took aim at wealthier pensioners, who have previously been bedrock loyal Conservatives. Policy shifts like this can be particularly damaging because they are unexpected: the Conservatives lose little in battles with public sector workers because such battles are largely expected by both sides and so “priced in” to the polling, but comfortable suburban pensioners had no reason to expect a raid by George Osborne on their income, so this unexpected new information may lead to a shift in political preferences. The previously loyal right wing press also seems to have turned against the government, so readers of newspapers such as the Telegraph and the Mail, found themselves much more negative and critical coverage of the government than they have come to expect. Once again, this unexpected burst of criticism may have prompted reassessment by previously loyal groups of voters. A fourth factor is the changing strategic position of the Liberal Democrats, who had previously functioned as a lightning rod for public discontent. Nick Clegg’s party, perhaps learning from the tuition fees debacle, came out early and prominently against top rate tax cuts and surveillance reforms, ensuring the Conservatives had to “own” these reforms without being able to use their junior partner as a human shield to fend off angry voters. A final fifth thought is that we should not underestimate the importance of longer term changes. Public grievances with the government inevitably build up over time, weighing on its popularity. This “cost of governing” may rise more rapidly during an austerity government, when more decisions anger voters than please them. As we move into third year of Coalition government, Cameron and Osborne may also be losing the ability to blame the previous government for current woes, as voters’ memories of the Brown administration fade and voters lose patience with continuing economic weakness. Some of the fall we have seen in the past month may therefore be a “last straw” effect, with the latest string of crises functioning as a trigger for voters whose discontent has been steadily rising to finally switch sides. We won’t know for some time whether the shift in March is a temporary blip or the start of a lasting realignment of opinion about the parties. While it clearly presents an opportunity to Labour, the other major political event of the month – George Galloway’s extraordinary by-election in Bradford West – served as a reminder that Ed Miliband and his party also remain in a weak position with voters. The public has lost faith in the main governing party over the past month, but it has yet to regain faith in the main opposition. 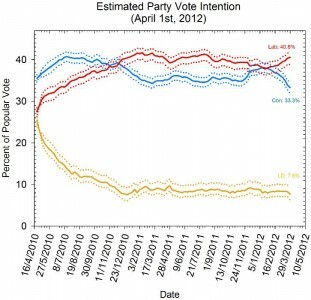 Faith in the Liberal Democrats evaporated over a year ago, and shows no sign of returning. A situation where the public is so hostile to all three of the mainstream political parties is very unusual, and suggests volatile times may be ahead. I wonder if your fourth factor suggests that, at least in this coalition, policy is being regularly parcelled out. NHS reform was a Conservative policy, AV a Liberal one, surveillance a Conservative one etc. Assuming that at the next election we have a repeat of the asinine leaders’s TV debates, this development will at least give the two leaders something to row about. Sorry, I ought to have written ‘leaders’ asinine TV debates’. I do not mean to suggest the leaders themselves are asinine. Loved this piece….thank you…can I follow you on twitter? I’ll recommend this on my blog but very well written analysis.